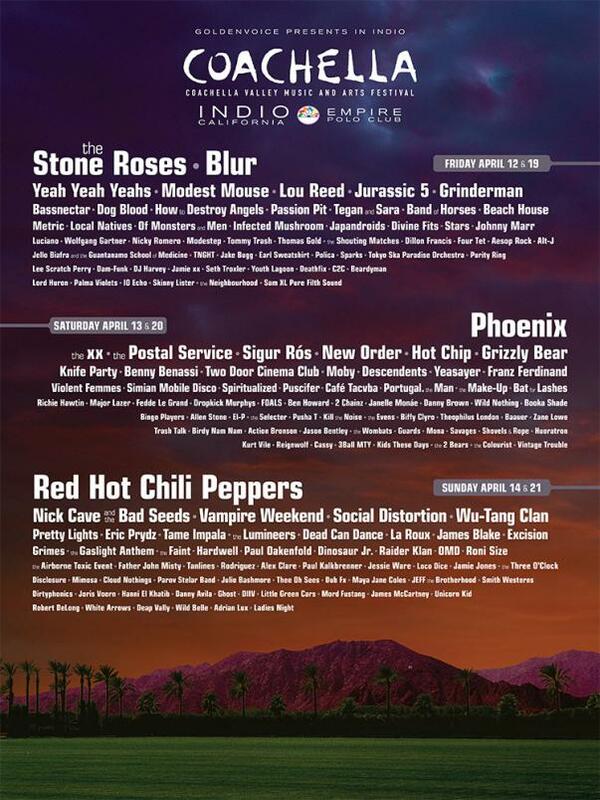 Coachella just announced their much anticipated lineup for the TWO-weekend festival on April 12-14 and April 19-21 at the Empire Polo Fields in Indio, CA. Headlining and performing both weekends of the sold-out festival will be Blur, The Stone Roses, Red Hot Chili Peppers, Nick Cave and the Bad Seeds, and Phoenix. As far as we’re concerned the real meat of the lineup is in the midcard with Tame Impala, Sigur Rós, Father John Misty, newly reunited – The Postal Service, Portugal the Man, Foals, Janelle Monae, and The Lumineers. Check out the full lineup. Despite making the bold move to go to two weekends last year (a move Austin City Limits has since followed), the popular Southern California festival has sold out in a flash in recent years so good luck getting your hands on a ticket! Festival passes for both weekends go on sale Tuesday, January 29th at 10 AM PST. Festival passes for Weekend 1 must be purchased with a shuttle pass or a car camping pass. New for 2013, the price you see is the price you pay — prices reflect all fees included. Layaway is no longer an option for either weekend.